As a long-time newspaper guy, I know that official proclamations aren’t worth the paper they’re printed on (or the electrons they take to paint your screen). They’re feel-good fluff designed to heat some niche constituency to a warm, fuzzy glow. But, it’s nice that the Gov (or someone who wrote it for him) was thinking of us. So, what’s the bad news if The Guv loves us? eliminate 84 percent of the OGT Tallahassee Office staff. 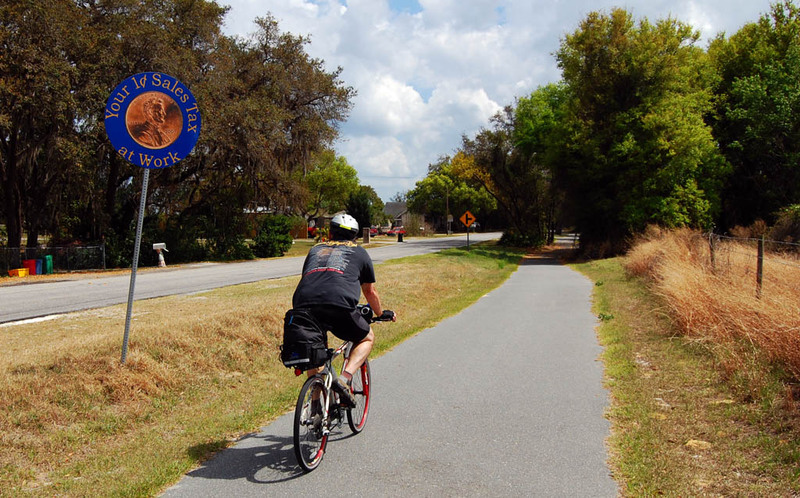 In addition to rolling back the pro-trail clock by at least 10 years, this measure will threaten nearly $50 million of hard-earned development money for Florida’s future trails by eliminating the positions that are responsible for administering these funds. This timing could not be worse; on-the-ground activity is ramping up to create green infrastructure and jobs associated with economic stimulus projects. The negative ramifications of this cut are far-reaching. Go to the Rail-to-Trails Conservancy web site and personalize a message that will be sent to folks who may be able to re-order cut priorities. I rode Lake County’s South Lake Trail two weekends ago (review to come). I stopped a county worker who was blowing debris off the trail to compliment him on the job he was doing. He apologized for the condition of the trail and said he was behind on his work because he had just come back after being laid off for seven months. The town of Winter Garden is undergoing a magical transformation and several shop owners said it was because of the increased tourism being brought in by the West Orange Trail. We went up to the Space Coast to watch the Space Shuttle take off, but we stayed overnight in Clermont to ride the South Lake Trail the next morning. 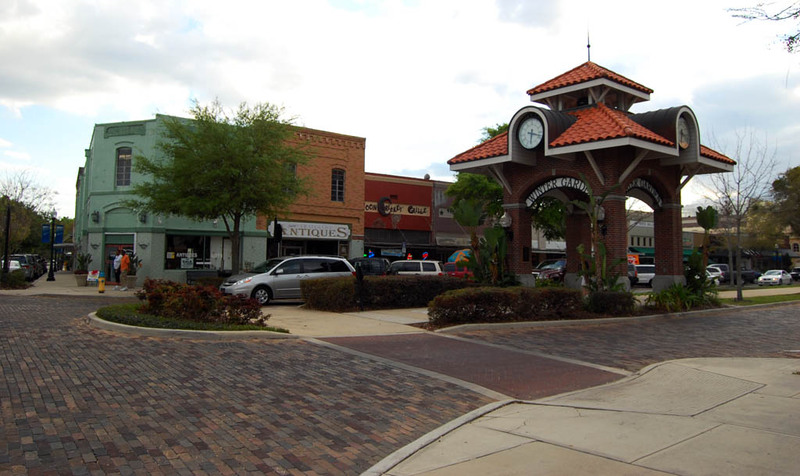 Clermont isn’t a traditional destination for folks who are in Cocoa Beach, 60-plus miles away. Before we left town, two families had spent a night in a hotel; we had breakfast in Clermont, gassed up our cars in Lake County, had lunch in Winter Garden and our Significant Others went shopping while we were riding. Those are dollars spent in a two-county area that were directly attributable to the Rail-t0-Trails program. Oh, I’m sorry. I guess Gov. Charlie already said that. I hope he expresses those sentiments to FDEP. 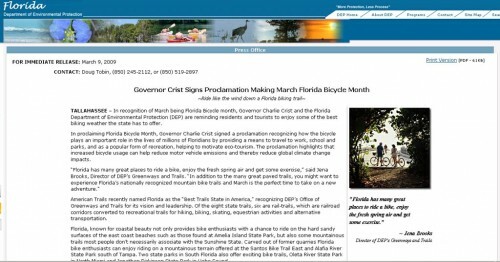 I passed your blog note on to some fellow Floridians and went to the Trails website and sent a not to the Gov and his buddies. I’m not holding my breath for any real action though. I’m looking forward to your review of the Lake County trail. The state has some great trails and they ARE a good excuse to get out and inexpensively explore the state a bit. Only a moron wouldn’t understand the positive impact of paved trails in Florida. I travel all over the state riding many trails, and spend money for food, gas, lodging, etc. If you build it, they will come. I have. Great blog. All the best.